The use of schedules is crucial when it comes to organizing and setting the cleaning time for catering businesses. Having a clear catering cleaning schedule is an important tool that every catering business must have in order to ensure that the food they serve to the guests is free from various risks that cause foodborne illnesses. It is through such type of schedule that one will be able to identify and properly organizing the list of the cleaning tasks that must be done in every catering event, the specific instructions that outline how each cleaning task must be done, who are responsible, and how frequent things happen. If you still do not have any idea on how to come up with your own catering cleaning schedule, you have come to the right place because, in this article, we have gathered the best catering cleaning schedules examples and templates that you can readily use for your future catering events. Do you own a catering business and currently have trouble in organizing your cleaning schedules? Worry no more because we provide you with this catering kitchen cleaning schedule that will give you an opportunity to find other organized ways on how you can tend to your kitchen equipment’s cleanliness. Without your kitchen equipment, you will surely not be able to operate your business. But despite such fact, not all of the staff will be willing to clean your kitchen equipment as an initiative, but as soon as you will make use of a cleaning schedule, you can already schedule its maintenance fair and square to every single individual in your staff. 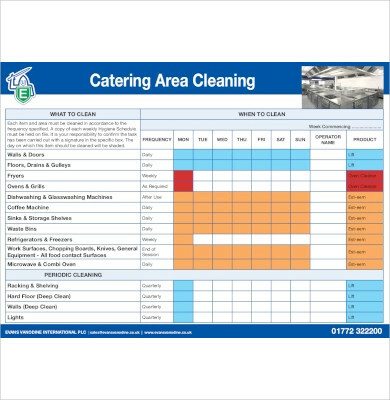 The Food Standards Agency has released this cleaning schedule that allows you to set a specific cleaning time effectively in whatever business you might be running, and that includes your catering business. 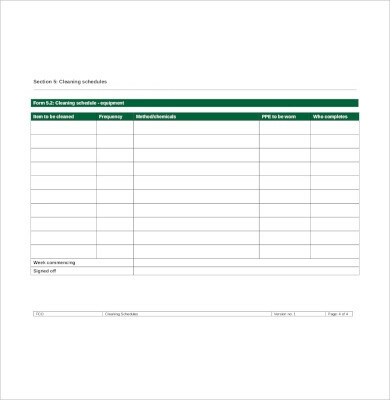 Through this blank catering schedule, you will be able to conveniently incorporate your personal touches and preferences that fit your business since this template is blank, meaning, you are free to write whatever is best for your catering business. 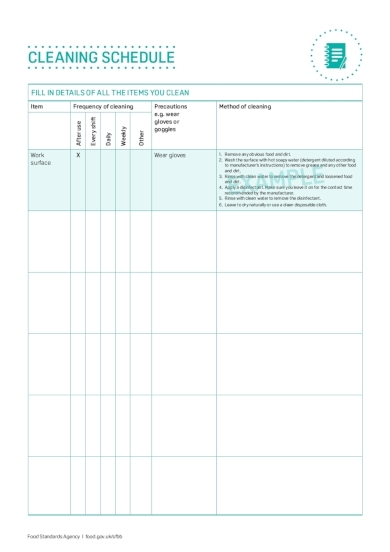 This template enables you to write how you want your cleanliness practices to be done by you and your staff. It is also suggested that you should put this up on the wall so all of you will be constantly be reminded of your cleanup tasks. Are you looking for a specific example of a schedule that displays how you should be cleaning every single area in your catering business? Then look no further because we give you this catering area cleaning schedule that would allow you to specify every single item and area that must be cleaned in your catering business. This schedule also comes with a specific frequency. Using this type of cleaning schedule is convenient for you and your staff since, as soon as a particular cleaning task gets completed, all you have to do is to shade the boxes to signify that its corresponding task has been accomplished indeed. If you are looking for a catering cleaning schedule that is even more specific, then do make use of this schedule that contains really specific items and descriptions for every single cleaning task that must be done in your catering business. It features a comprehensive list of the things that you must do and the specific time and day when you should be doing it. If you have quite a number of kitchen equipment, this example is also just as effective since it allows you to even specify the product name and code of each kitchen equipment as well as its corresponding directions on how you must handle every single equipment. 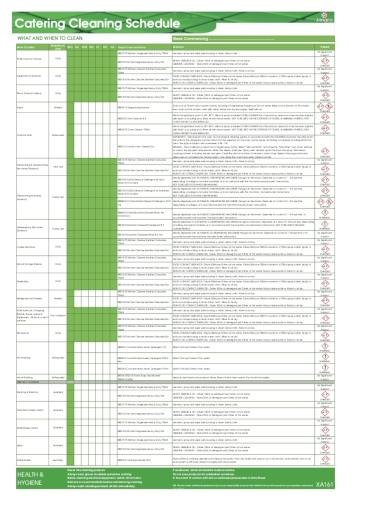 And additionally, this example allows you to specify the hazards of handling each equipment. Every single kitchen equipment that you use for catering business must be cleaned and inspected on a very frequent basis in order for you to ensure that you can assure your customers that the food you are serving to them is free from any harm or might possibly cause them of some sort of illness. Through this type of cleaning schedule, you and your staff will be thoroughly informed about the details on how one must clean certain equipment. 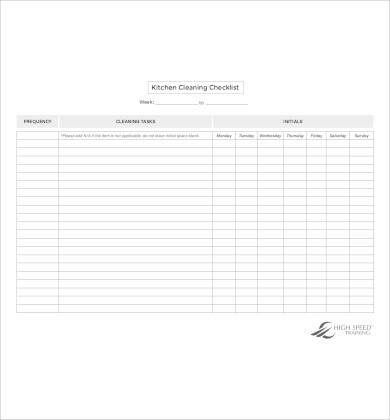 So if you or one of your staff members do not know of the fact that there are some kitchen equipment that has to be disassembled in order for it to get thoroughly cleaned, then you and your staff already would because this cleaning schedule contains specific instructions that would allow all of you to perform proper cleaning procedures. 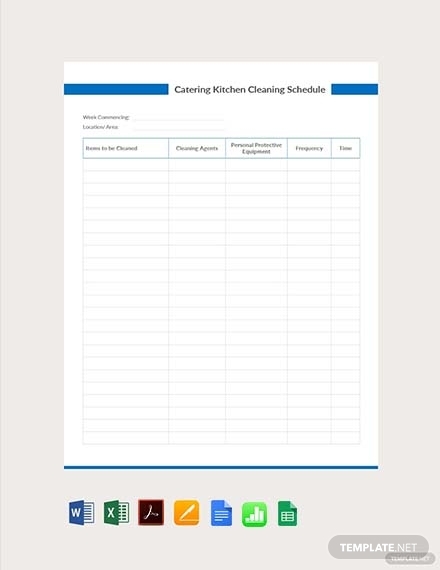 Here is another catering cleaning schedule that will allow you to set a schedule for when you and your staff must conduct a cleanup time for every single kitchen equipment that you use for your catering business. Through this template, you are given the chance to look and determine whether there is some equipment that needs major repair or even a major replacement. Your staff can also conveniently inform you if there will ever be a need for any safety concerns with the equipment used in your kitchen. To succeed in the catering business industry, it is important that you must follow through with a cleaning catering schedule since any lapses that are related to the cleanliness and sanitation will surely affect your business’s reputation. You wouldn’t want to put people in harm’s way caused by your catering services, right? We hope that this article has provided you with enough cleaning schedule examples and templates that can help you with your catering business. Do take note that these templates can be easily downloaded and customized using various editing software programs that you are already familiar with.